A video service released sequel about the Cossacks adventures known since childhood within the framework of a new content production project in association with the animation studio Baraban and Eduard Kirich, a scenario author of an original Cossacks epos. MEGOGO financed rebirth of the animated legend, the first series of which were produced over 40 years ago (in 1970). Modern animated series describe adventures of the heroes in Europe. Football subject has been chosen not coincidentally and confined to the European Football Championship starting on June 10, 2016. Each new series tells us about countries and national teams contended by our heroes in a football battle. “The Cossacks” coming into the world has a paramount importance for VOD-segment development in CIS region as legal video services started producing their own content. And for us this is also a huge responsibility before the users – the entire post-Soviet area audience. We’ve created not only a new animated product, but also a fabulous story continuation, dating back long before MEGOGO and Internet emergence. Thus,“The Cossacks. 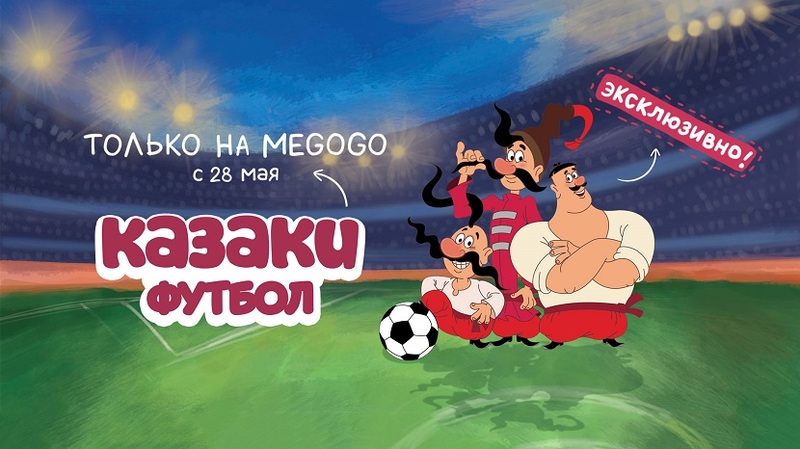 Football” turns to be an important event for the entire post-Soviet animated cartoons and marks the beginning of the active industry participation age in the content production, – says Vladimir Borovik, MEGOGO CEO. Starting from now continuation of the animated cartoon will be available for the users in the main territory of video service operation: CIS and Baltic countries, Ukraine and Georgia, as well as viewers all over globe. The cartoon is available on a free-of-charge basis under advertising model on all popular platforms – site web-version, mobile devices for iOS, Android, Windows and in MEGOGO application for Smart-TV. These “Cossacks” will include 26 series. The cartoon is still being worked upon and the first series are available now at: http://megogo.net/ru/kazaki. In the nearest future the viewers will see new series – they will be released during the European Football Championship. Total budget of the project made up several hundred thousand dollars. MEGOGO possesses a unique title to produce this cartoon on the Internet all over the globe on any device. “Release of the animated cartoon “The Cossacks. Football” is the first MEGOGO step in production of its own content. In the nearest future we will introduce several projects, which, as we’re convinced, will underlain new industry standards”, – concludes Vladimir Borovik. MEGOGO announces joint projects with national producers of series and full-length films. According to the representatives of the video services, MEGOGO agreements on entering production in several large projects in the CIS territory are being currently finalized. Moreover, the plans about production of niche content exclusively for the Internet audience will be disclosed in the nearest future.